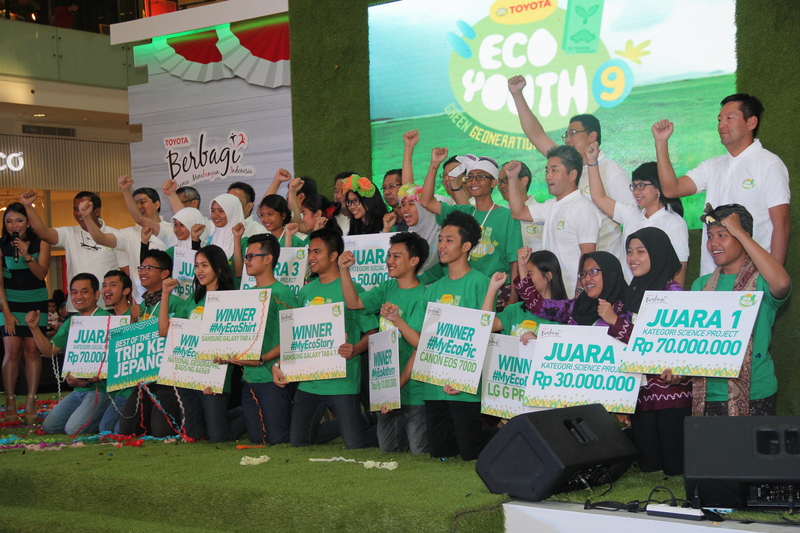 Jakarta – 20 schools that consist of both senior high schools and vocational school which became the finalists at the 9th Toyota Eco Youth (TEY) succeed in completing the environmental project realization and obtain assessment from the jury. According to the judges, there were 3 winners for each categories that consist of Science and Social category. There was also 1 other winner in the “Best of The Best” category. For the Science category, SMAN 6 Denpasar with their “Lembah Upacara Yadnya” project came in first place, SMAN 1 Blora with their “Vertical Axis Windmill and Solar Cell as a Power Plant in Insect Traps” came in second place, and SMAN 6 Banjarmasin with their “Development of a Simple Tool to Neutralize the Acidic Peat Swamp Water into Consumable Water” came in third place. For the Social category, SMAN 19 Bandung with their “Decrease Pollution with Interaction” Babarengan project, came in first place, SMAN 5 Surabaya with their “Cyber Nature” project came in second place, and SMAN 1 Ubud with their “Bike & Walk, Prevention of Functional Shift” project came in third place. All the winners in each categories are entitled to a Rp70 million worth of price for the winner, Rp50 million for the runner-up, and Rp30 million for the third place. Meanwhile, “Best of The Best” winner that was achieved by SMAN 19 Bandung would receive an additional prize of environmental training in Japan. Therefore, total prize given in the 9th TEY program reached Rp660 million. Today, the awarding ceremony for the 9th TEY was held in Jakarta. TEY is an environmental-based competition targeted towards high school students that was organized by Toyota Indonesia that consists of Toyota Astra Motor (TAM) and Toyota Motor Manufacturing Indonesia (TMMIN). President Director of PT Toyota Motor Manufacturing Indonesia (TMMIN), Masahiro Nonami, mentioned the success of the well conducted 9th TEY is due to the good teamwork between Toyota Indonesia, Toyota dealer network in Indonesia, media friends, and the active support and participation of all the schools, jury, and surely the Government of Indonesia. “We hope the Toyota Eco Youth program can also support education in Indonesia, especially innovative culture research, and education with knowledge of the environment, to reach a better Indonesia in the future,” said Nonami. Since its presence in Indonesia more than 40 years ago, Toyota Indonesia still sought to increase contribution towards development, from industry development to various social activities, including an active involvement in environmental conservation. One way is through TEY that is a part of Toyota Indonesia’s commitment to participate and develop the younger generation in environmental conservation through competitions that would increase their awareness and active role. The very first TEY was organized in 2005 and now enters the 9th year. The 9th TEY took the Green Geoneration theme and has officially started on September 2014. TEY program is divided into 2 main categories and 1 additional category, which are Science category where the participants are required to incent a product/object that would benefit the environment, and the Social category where the participants are require to develop a motion or campaign that would persuade society to contribute towards the environment. Lastly, the additional category involves improvement done in the execution of the 9th TEY. In a separate occasion, the Vice President Director of PT Toyota-Astra Motor, Suparno Djasmin, mentioned that this year the students’ interest towards TEY competition increases compared to the year before. “TEY competition this time is much stricter with a 3 times increase of total participants compared to last year”, he said. Furthermore, Suparno Djasmin mentioned that TEY aims to increase awareness towards environment among the younger generation, because in reality, the environmental development related to an extensive aspects that demand a higher creativity. According to Suparno Djasmin, the 9th TEY succeeded in encompassing high quality projects from Indonesia’s younger generation. Therefore, we should be proud of them, especially the participants of the 9th TEY that have excellent potential in providing innovative ideas to save the environment for a healthier and cleaner life. The total proposal entry reached 1,709 proposals, which would be then selected by the jury. 20 of them would be picked as the finalists that consist of 12 science projects and 8 social projects. The finalists are given opportunities to join workshops to objectify their proposals with the funding and guidance from Toyota Indonesia. According to the efforts to improve the participants’ quality, the assessment criteria which are the involvement of society, idea originality, presentation skills, and the projects sustainability are each given a 25% weight. In the assessment process, Toyota Indonesia management team gets help from education experts, such as Prof. DR. Arief Rachman Hakim, M.Pd (Professor in Universitas Negeri Jakarta), DR. Jatna Supriatna,Phd (Head of Climate Change in Universitas Indonesia), Rene Suhardono (social media specialist & social movements), and Didi Kaspi Kasim (media practitioners). Toyota Indonesia thrives to increase the quality and prestige of TEY. The improvement is done because TEY is considered as one of the important vessel and community for the students to create, discuss, and share ideas regarding environmental conservation. The crucial point of this program lies on the environment problem solving, either inside or around the school. Therefore, the goal is to create younger generation with more awareness towards their environmental surroundings. With the making of those communities, the efforts to persuade activities such as environmental improvement and conservation are believed to grow among the younger generation. Improvement done at the 9th TEY is in the competition variation. This time, the competition is not merely in a form of an environmental project, but there is also an additional 6 categories of activities such as My Eco competition, yaitu My Eco Shirt, My Eco Doodle, My Eco Anthem, My Eco Story, My Eco Meter, My Eco Pic. With the additional programs, the participation element of the schools in the 9th TEY program would hope to be widen. Another improvement is done by widening the socialization scope from 5 cities which are Jakarta, Makassar, Surabaya, Jogjakarta, and Medan, to 10 cities in Indonesia, with Bandung, Semarang, Denpasar, Balikpapan, and Manado as the addition. On the other hand, the 9th TEY program differs from the previous programs because the last assessment process is done publicly, therefore could act as a role model for other students and public society. The 9th TEY has more quality because the winners of the competition not only receive funding aid for the project development but also receive an opportunity to participate in a short environmental training in Japan. Since first held in 2005, TEY had involved more than 750 schools and 2,343 projects originated from various schools in all regions of Indonesia. “We would like to say congratulations to all the winners. Hopefully their acts would bring positive impact and inspire their friends and society,” said Nonami.